Details: Terra cotta ornament and details, window tracery, finials. Historic Features: Twin Gothic towers, bay window, Gothic terra cotta ornament and details. Alterations: Massive additions on all sides, original building is partly obscured behind additions. 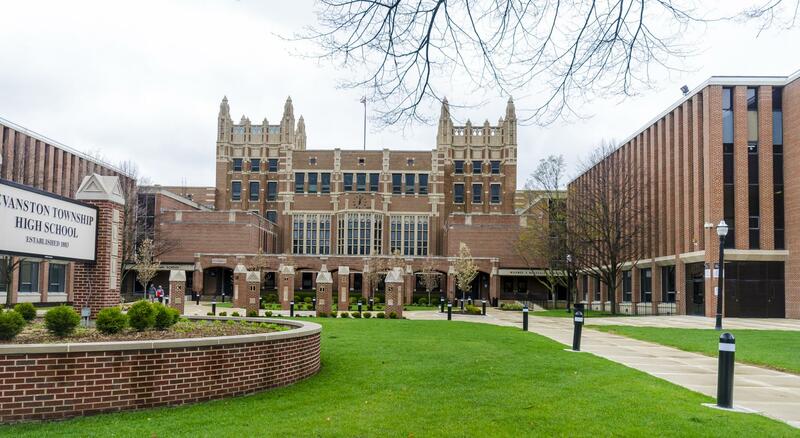 Original Owner: Evanston School District 202 "Evanston Township High School"
Exterior Alteration Permits: 13MSWK-0012: replace 3 antennas and 3 radio heads; 12MSWK-0100: remove 3 antennas, replace 9 antennas, and replace q cabinet; 09MSWK-0111: install 6 antennas and new 10 x 10 shelter; 04MSW0000000005: install antenna array on smokestack + equipment on rf; 01MSW0000000003: retention walls for man-made pond, electrical & new parking lot.